Systems for providing the cooling of air or liquids when supplied with a source of heat such as from a solar collector. Cooling towers: Not solar powered, just using water to cool the incoming air. Exhausting the hot air can be solar assisted, however, via a vent chimney. Solar Refrigeration: Doesn't cool when the sun shines, but the energy is used to dry out an adsorbing media (zeolite) which then re-absorbs water evaporated by the load (refrig) at a lower than normal temperature due to being held in a partial vacuum. High cost. $23,000 for the average house. Many panels required to cool a small space. https://www.ted.com/talks/aaswath_raman_how_we_can_turn_the_cold_of_outer_space_into_a_renewable_resource Materials that reflect the suns radiation and transmit heat through the atmosphere into outer space for daytime cooling. http://www.solcool.net/ 2 ton AC/DC system offers greater efficiencies via direct DC drive from solar panels. Also incorporates an "Ice Battery" to store cold night air. 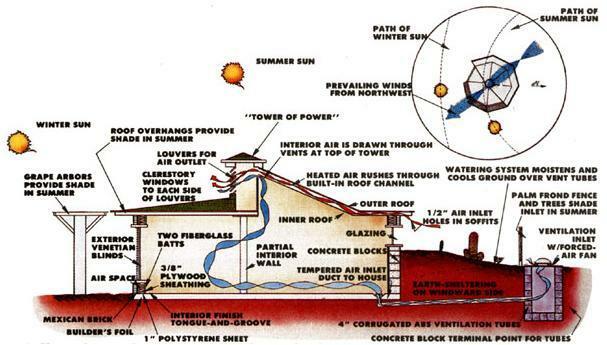 Another natural form of air conditioning / ventilation is to use the solar heat to evacuate the hot air from a house, and cause cool air to be drawn in from an earth tube. Note that the cooling effect is actually provided by the thermal mass of the earth around the tube; the sun is simply pumping the air. This technique was used or invented by the Romans a long time ago. A trench 6 to 12 feet deep and 100 to 200 yards long was dug leading from the "house" in a straight line away from the house. Into this trench a large diameter pipe (these days corrugated drainage pipe 2 or 3 feet diameter) was laid, with holes drilled into the bottom to drain water that condensed inside the pipe. The trench was then covered over. At the far end a 90 degree elbow was attached and more pipe added so that it reached above ground and the end covered with some sort of wire mesh attached to keep out unwanted things such as rodents, etc., and then another elbow could be added at this end to shield against rain. The house end of the pipe entered the house and was the source of incoming air. The key to making this work is to add a convection chimney. The Convection chimney is built such that it's inside opening is at a high point inside the building. On the outside, two intersecting sides of the chimney; are painted flat black, and the resulting V formed by the two connecting sides face south. In other words, the V needs to face the mid point between where the sun rises and sets. The two other sides must be transparent, Plexiglas or some equivalent. Also, the higher/larger the chimney, the better. How it works: the sun heats up the chimney causing the air inside to rise, thus drawing air through the cool pipe. The pipe cools the air drawn from the outside to the temperature of the earth at the depth at which it is buried (which is virtually constant year around at this depth). By the way, an interesting note: Even in cold climates where the ground is frozen, the incoming air is only 32F when the air outside may be much colder, we need only heat the air by 38F to bring it to 70F; as opposed to heating outside air of say -15F to 70F we would have to heat the incoming air by 85F - quite a difference in the amount of heating energy we would have to supply by some other means. Of course, without the sun to warm the chimney (or some other source) the system isn't worth fooling with. Other possible replacements for the chimney are Whole House Fans. 1. Surface area, NOT size. It does no good to dig a 10 foot diameter tunnel since the air in the center is insulated from the cooling effect of the tunnel wall. 2. Maintenance will be required. Animals, weeds, roots and all other manner of bad things will happen. I would (have not yet) find an area near the space to be cooled which slopes away (for drainage) and then dig a pattern of deep pits, like fox holes. I would then use an auger to dig horizontally (slightly down slope) between the pits and line the holes with sections of metal pipe assembled in the pits. The pits would then be covered with an insulating material which can easily be removed to allow access to the pipe segments for cleaning or clearing with a rag tied to the top of a flexible pole. The ideal landscape in which to install such a system would be a something like the side of an overturned bowl. Imagine cooking a chocolate cake in a shallow bowl, then emptying it out onto a platter. Built your house at the top and then cut small pie shaped sections every few inches around the cake, but remove only the top half of each cut section and then only back into the mound a short distance. Now, push soda straws between the cut out sections, near the bottom of the cut so that they are linked around the side of the mound. Remove all but the shell of the sections you cut out and use them to cover the openings so that the ends of the straws are still open, but the air will not be able to leave the overall straw system. At the end, use a bendable straw to direct the air up to the house on top and the solar tower. If you can't find that terrain, you might be able to get away with long metal tubes, very gently curved and buried with a ditch digger so that both ends are above ground. Small drainage holes will need to be drilled along the lowest point of the pipe and gravel or other darning system installed at the bottom of the ditch before the pipe is laid in. Connections between pipe segments would be made with a manifold or other plumbing above ground and should be well insulated. Cleaning or maintenance would require the disassembly of the manifold so some form of normally covered opening on the opposite side of the manifold from each pipe could be a very helpful addition. Easy to install, maintain and provides a large surface area of contact between the ground and the air. Why not combine a chimney and a cooling tower? One outer shell of thermally transparent material, inside that, a heat exchanger to transfer radient solar energy into the air, then an insulative layer and finally, a cooling tower with some combination of water mist, evaporative pads, or thermal conductors driven into the ground. I had a crazy idea some time ago, about using a small, cheap solar collector to produce superheated steam (and my father and I did build the device described up to this point and it worked just fine) and then use a venturi to trade the velocity of escaping steam for volume of air moved (inject steam via a fine pitot into the opening of a pipe so that outside air is pulled into the pipe) [ed: better yet, use the steam jet to create a vacumn in the exit pipe on the hot side and avoid the temp increase of the steam on the inlet side] and then direct that into a Hilsch Vortex tube to produce hot/cool air for house A/C. I would guess that back pressure at the entrance to the Vortex would limit the incoming air volume excessively or that the increased temp of the air (due to the steam injection) would negate any cooling gains on the part of the Vortex or some such other problem would prevent it from working. The nice thing would be: No moving parts other than the water and the air and the collector (sun tracking), automatically starts when the sun heats it up, super low construction cost, almost zero operating cost (only maintenance and water supply). The potential inefficiencies are offset by the low (zero) cost of water and sunlight. Use of steam for refrigeration was a standard technique early this century. AFAIR, steam was expanded through a nozzle and drew air from a venturi tube (?) creating a low pressure region with accompanying cooling. Old or complete air conditioning books would cover this - I have only seen it described once. The advantage is, as you note here, that you can convert available thermal energy into cooling. Also, there are no moving parts. You could also consider using a "kerosene fridge" type arrangement which uses heating to drive an adsorption cycle using, typically, ammonia and water. Only moving parts here are the fluid(s). This may be easier as the technology is current and common and you could copy an existing fridge or use an existing one and simply heat the appropriate point. Hilsch Vortex / Wiebel Rohr / Maxwell's ... typically seems to like around 100psi (7 bar / 700 kilopascal) but lower should work with suitable "design". ...Randy Hees at Ardenwood Historic Farms (infoseek search results) in [Fremont near] Newark, CA. The farm and the Society For the Preservation of Carter Railroad Resources are some of the most knowledgeable people in the country about obsolete technologies. Randy Hees is pres. of SPCRR. It relies on what is termed an "ejector" or "steam ejector" or a thermodynamic compressor. These terms are in fairly standard use. Steam from a highish pressure source is expanded through a diverging nozzle and then run on through a longer converging section. The pressure drops in the initial section and then rises again to a lower level. At the lowest pressure point (at the end of the initial expansion section) a hole is placed which enters into a chamber. The result is to lower the pressure of the attached chamber and entrain any vapour from this chamber into the expanding and contracting steam. The drop in pressure in the chamber causes vaporisation of the water in the chamber to produce cooling. Systems I have seen described recently said that a steam pressure of about 10 bar is typically used and that the steam vaporised is about 20% of the total vaporisation. ie about 4 times as much vapour is derived from the chamber as comes from the steam boiler. with a small slot cut near the bottom of the lower bend for the hose clamp to pass through. They are clamped along the re-bar. Spread the top open, insert a decorator mirror and let go. This clamps the mirror. Loosen the hose clamp, align the mirror holder so that all the mirrors point back to a common point centered above the collector. At this focal point, rests a boiler on a mast of two pipes (water in, steam out). Bolt the stack of razors together with two long very high test bolts. Use big very high test washers on either end. Vice them so that the edges are PERFECTLY aligned. Tighten them with breaker bars till you are sweating and the heads and nuts round off then tighten them some more. Smooth any irregularities along the sides of the stack. Cut a slot in the end of the air tank just the width of the stack of razor blades and cut two holes for the pipes and one for a pop-off valve. Take the blades, pipes, and tank to your local welding shop and challenge them to weld the stack into the slot (I know it can be done, I've seen it, wrapping the stack in super thin steel foil helps) and the pipes into the holes so that one is almost to the top and the other is near the bottom. Also weld on the pop-off valve (a mother big chunk of steel with a 1" hole in one end that rests over a short length of pipe with a cap that has a small hole in it; remember pressure cookers?). Pressure test the boiler professionally. This boiler will work very well. Nothing transfers heat into water like a stack of razor blades. We need a small (very high pressure) water injection pump, a sun tracking actuator, and maybe a better pop off valve. I can't remember how the injection pump knows when the boiler needs water. http://www.suburbia.com.au/~mickgg/competitive_edge.htm The Competitive Edge...... ........or how to keep your cool in a deregulated energy market. 4,882,907: A solar cooling process using tap water, brine, a flash chamber (? ), an absorbtion chamber and a solar evaporator. how much degrees does an ejector cool the water in a steam ejector refrigration system?+ Darn fine question. There just isn't enough documentation available to answer it. I'm looking at buying a home with a dirt basement on a city lot, so I don't have 200 yards of ground to put pipe in. However, it does have a dirt basement. Is there anything that says the pipe has to be straight AND not underneath the house? Could I curl it around in a spiral underneath my basement's dirt floor and have the far end duck under the foundation and come up just outside the house? James Newton replies: For cooling tubes, you want as much surface area surounded by as much earth as possible. So the ideal configuration is a lot of tubes radiating deep into the mass of the earth. And since the air temperature in the tube will reach the air temperature of the earth fairly quickly with a low volumn of air flow, you don't need that long a tube unless you are pulling the air through quickly, which takes more energy and is therefore less efficient. Another issue is one of condensation and moisture in the pipe. That can lead to mold and serious health problems. To prevent it, the air inlet of the tube must be at the low point and there has to be a steady slope all the way down so the condensate can drain. This is hard to ensure with a coiled pipe.